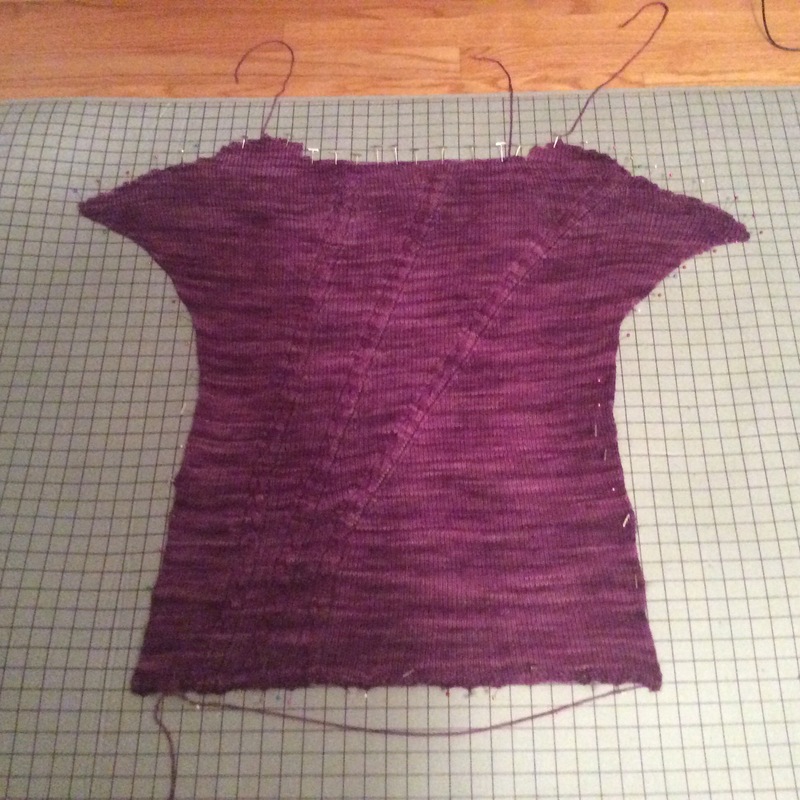 It isn’t too often that I share works in progress but I thought I’d make an exception for this purple slant cable top. I stumbled across a slant cable top pattern on Vogue Knitting, this month during a blowout pattern sale. I altered the pattern a bit for me (I have broad straight shoulders) and lengthened it a bit. This top is knitted in two pieces from the bottom up and for the most part this was a pleasure to knit, though things got a little monotonous around the top edge. I also had to keep a running journal of which row I was to knit next since the pattern instructions are full of “AT THE SAME TIME” notes, which I now realize I don’t care for in a pattern. I find it easier to read the entire pattern and write out exactly what I’m supposed to do on every row or round instead of trying to remember to k2tog at the beginning of every other row and AT THE SAME TIME increase 1 stitch every 12 rows and AT THE SAME TIME slant the second cable every four rows and AT THE SAME TIME slant the third cable every six rows starting on the 24 row and AT THE SAME TIME…see how annoying that can be and impossible to keep straight while watching various Alaska shows on TV. Oh well, here is the front being blocked. The back should be a breeze.